The stunning data breach recently disclosed by Equifax, one of the nation’s top three credit reporting agencies, has imperiled millions of consumers, opening them up to identity theft, monetary losses and colossal headaches. Equifax investors are also shouldering the burden associated with the company’s apparently lax security practices. Since disclosing the breach, Equifax’s stock has fallen more than 30 percent, losing its shareholders $5.3 billion in market capitalization. It remains unclear, though, whether the company’s executives will take a financial hit for the failures that allowed thieves to steal Social Security numbers, driver’s license numbers and other sensitive data. Indeed, Equifax’s top managers may not feel any financial ill effects, given the company’s past compensation practices. 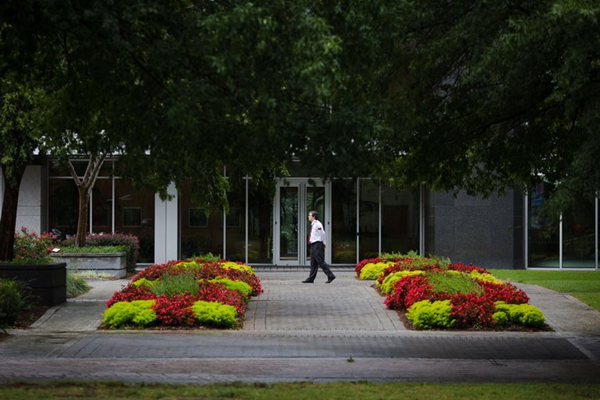 Over the last three years, when Equifax determined its top executives’ incentive compensation, it has used a performance measure that excluded the costs of legal settlements made by the company. If it follows this practice after dealing with the costs of settling legal claims arising from the security breach, Equifax’s top managers will essentially escape financial accountability for the blunder. I asked Equifax whether its board would stop excluding legal settlement costs from executive compensation calculations so that management would be required to absorb some of the pain. Equifax is not alone in excluding certain costs of doing business from the financial factors it uses to determine executive pay. Such practices have become prevalent among large United States companies. Equifax uses two main performance measures to decide incentive pay. One, called corporate adjusted earnings per share from continuing operations, is not calculated using generally accepted accounting principles, or GAAP. It is figured by excluding certain costs — such as those related to acquisitions — that normally flow through a company’s profit-and-loss statement. This has the effect of making Equifax’s earnings per share look better in this measure than they actually do under accounting rules. 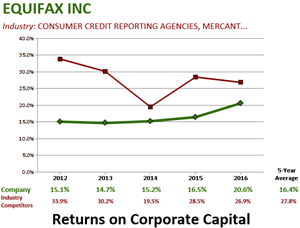 Equifax says in regulatory filings that it uses the adjusted earnings figure because it best represents the company’s profit growth. Top managers at the company get a larger or smaller annual incentive award based on increases in this measure over the course of a year. Acquisition expenses make up the bulk of the costs Equifax has excluded from its profit calculation in recent years. But Equifax has also excluded costs associated with impaired investments and legal settlements from the figure. In regulatory filings, Equifax said its exclusion of legal charges from certain financial results “provides meaningful supplemental information regarding our financial results” and is consistent with the way management reviews and assesses the company’s historical performance. This approach is not unusual. Roughly one-fifth of the companies in the Standard & Poor’s 500-stock index excluded legal settlements and fees in their non-GAAP earnings measures in 2016, according to Jack Ciesielski, publisher of The Analyst’s Accounting Observer and a close follower of companies’ financial reporting. When settlements are small, of course, excluding the legal costs associated with them is a nonevent. And in recent years that has been the case at Equifax, with settlements equaling around 1 percent of net income. In the fourth quarter of 2016, for example, Equifax recorded a $6.5 million charge for a settlement with the Consumer Financial Protection Bureau. Under that settlement, which involved deceptive marketing of credit scores to consumers according to the bureau, Equifax paid $3.8 million in restitution to customers, a fine of $2.5 million and $200,000 in legal costs. But the scope of Equifax’s recent security breach is so far-reaching that legal settlements arising from it will most likely be enormous. And this brings up another question: whether Equifax executives should return past pay because of the security failure. Certainly, last year’s proxy filings indicate that the pay received by the company’s top three executives was based in part on their accomplishments in keeping consumers’ data secure. Or take John Gamble, Equifax’s chief financial officer. He also received a rating of “distinguished” on his individual objectives, the proxy said, because he continued “to advance and execute global enterprise risk management processes, including directing increased investment in data security, disaster recovery and regulatory compliance capabilities.” Mr. Gamble received $3.1 million in 2016. John J. Kelley III, the company’s chief legal officer, also achieved a “distinguished” rating from the Equifax board last year. One reason: He continued “to refine and build out the company’s global security organization.” Mr. Kelley received $2.8 million in compensation last year. Will these executives be asked to return any of this pay given that their ratings on security are now looking a little less distinguished? Equifax declined to answer this question. What the Equifax mess seems to show, yet again, is the heads-I-win, tails-you-lose deal between executives and shareholders that is so prevalent at major corporations today. A version of this article appears in print on September 17, 2017, on Page BU1 of the New York edition with the headline: Who’ll Pay For the Mess At Equifax?. 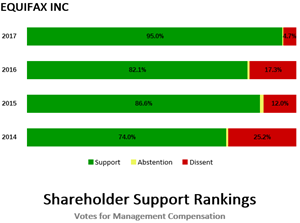 The following graphs of competitive corporate performance and of shareholder voting support for executive compensation are presented for the company addressed in the article. Full-size graphs of these and other companies you may select can be generated on the Shareholder Forum's websites for Returns on Corporate Capital™ and for Shareholder Support Rankings™. Definitions of both analyses are presented below. Returns on Corporate Capital™ (ROCC) is based on published Methodology and Specifications for calculating net income plus interest expense and income taxes, divided by the balance of total assets less current liabilities other than current debt, according to each company's audited statements of GAAP-defined data as reported to the SEC, without adjustment. The ROCC of each company’s industry competitors is based on the same calculations of the aggregated assets and income for all SEC-reporting companies in the relevant industry other than the subject company. The analyses are produced by the Shareholder Forum using data provided by EDGAR Online from SEC records of approximately 5,700 currently reporting public companies. Shareholder Support Rankings™ analyses are produced by The Shareholder Forum from research data provided by Proxy Insight, based on company SEC reports of total votes cast in advisory “Say on Pay” shareholder approvals of executive compensation. © Copyright 2012-2017 The Shareholder Forum, Inc.